Over the past 4 years, I have had a Keurig at my office. I love the convenience of the machine and the variety of flavors. In the winter, I can make myself a hot cup of coffee, tea or hot chocolate. 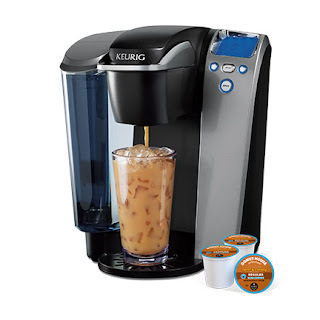 Yet in the heat of the summer, I live off of iced coffee and although you can add ice to any cup of Keurig, it isn't the same. Until now!!!! 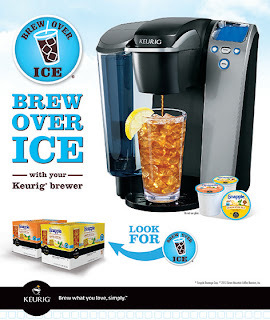 Keurig recently launched a new line of K-Cups that you can brew over ice. 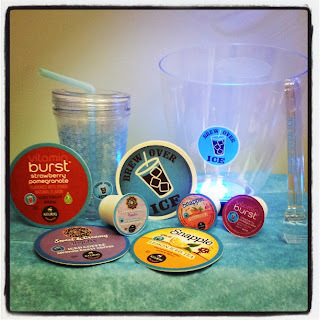 I was ecstatic upon finding this out and the fun group at Keurig kindly sent me a gift package which included 3 Brew Over Ice K-Cup® samples, 1 Brew Over Ice tumbler, 4 Brew Over Ice coasters and 1 Brew Over Ice light-up ice bucket! 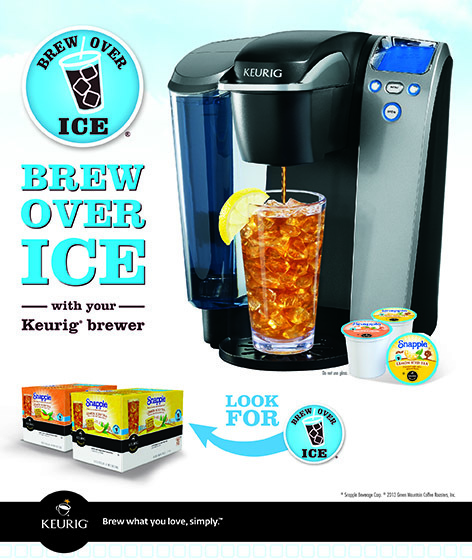 The Keurig brew over ice line includes everything from Snapple to Donut House pre-sweetened and creamy coffee! I took my goodies straight to my office where I took advantage of our Keurig Office Pro machine! I love this machine since It allows you to use taller cups. My favorite of the three flavors I tried out was the Donut House Coffee. Keurig wants to send the same package I received to one of my lucky readers. AND there is currently a huge giveaway going on over at http://game.brewoverice.com. The grand prize is $10,000!! 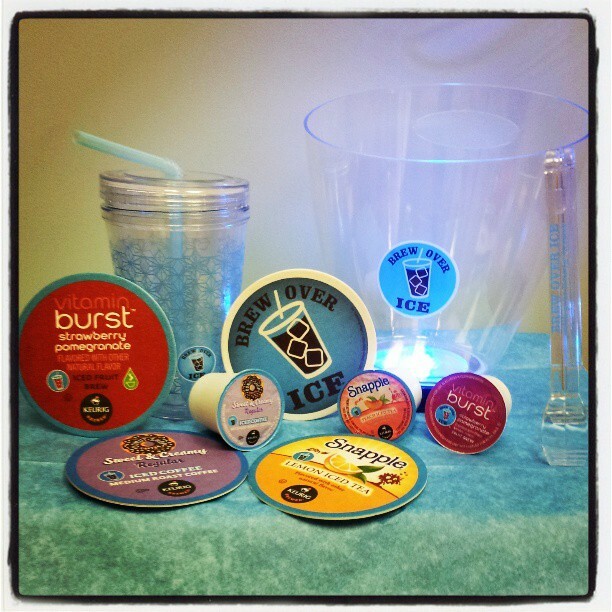 You can also enter daily for a chance to win instant prizes. While you are there, make sure you download a $2 off coupon (click here). Enter to win this prize pack through the Raffle Copter widget below. Also, let me know in the comment field what your favorite summertime drink is! Make sure you like Keurig on Facebook and Twitter! Disclosure: I received the Keurig gift pack for review. As always, all opinions are my own. Also, I received the Cuisinart version of the Keurig and I've been buying different k-cups to try out! I am definitely an iced drink drinker so this pack would be perfect for me! OHH I may have to take a trip to Whiskey Joes and try that!! Let's make a HH plan after I get back from NOLA! Coincidentally I just purchased my first keurig, today!! I absolutely love iced coffee in the summer! I saw you were talking about getting one. You will love it!!! I'm an ice water girl....when I'm heading out for a run I add NUUN. I primarily drink H2O. Cucumber water is my fav! Love Firefly!! I usually drink mine with water and a lot of lemon but w/ Crystal Light is super yummy too! Cucumber water is my favorite!!! The brew over ice sounds fantastic! I would love to try it. Island Coconut Coffee over ice!